This shot was taken in my studio in London in the 80s. 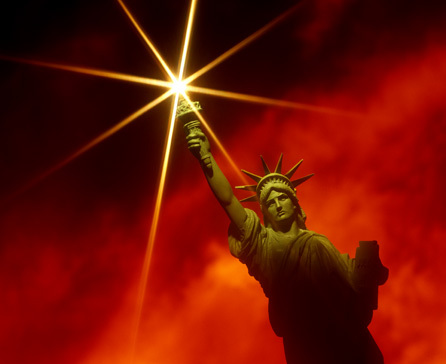 … and they have made the present large by dancing in it. Said Alastair Macaulay, dance writer for the New York Times, in his piece published on June 10th 2007, covering the retirement of four prima ballerinas. Prompted by the unusual timing of seeing four long serving masters of their art, all retiring in quick succession, Macaulay wrote a truly tender, eloquent and impassioned tribute to ballet and specifically these four prima ballerinas. With decades of knowledge and critical experience he expertly identifies the distinct individual genius they offered the world. He makes it brilliantly clear why their departures are a poignant loss – and their careers cause for celebration. The four are Darcy Bussell, Patricia Barker, Kyra Nichols and Alessandra Ferri. The full article is available on the New York Times site but requires a subscription. The images below are from a series of ballet theme shots produced in my London studio in the 80s. I also constructed the set. For clarity images from spreads are repeated as individual shots. 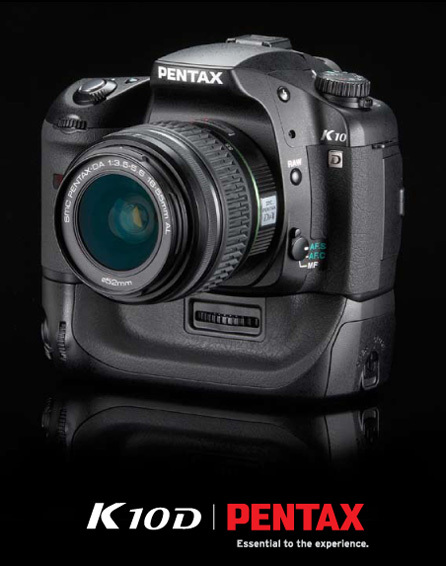 Pentax have released the K10D SLR. Finally, a digital camera that is nudging well into the professional space from a manufacturer that I have supported for decades. I have been clinging to my old and much loved 6×7 bodies and their excellent Pentax lenses. Together they have been my staple image capturing system for over 30 years and continue in that role. The K10D has won a ‘Highly Recommended’ rating from dpreview.com and been awarded the Editor’s Choice from American PHOTO. It also won a best Expert D-SLR award from the Technical Image Press Association, Camera Grand Prix Award from the Camera Journal Press Club and Editor’s Pick from Wired magazine. At the high end of the digital market something like the new Sinar Hy6 with a Phase One back and Zeiss lenses is a system to covet (with eye-watering costs) and certainly outguns the K10D for pure quality of capture. But here is an amazingly advanced camera with excellent output for a $1,000. Like most modern digital SLRs the K10D is really a little handheld graphics workstation with a lens on the front. For someone who started his career hand developing sheet film from large format 4×5″ and 8×10″ cameras I marvel at these new imaging tools. Any self respecting photographer will tell you, a good professional should take a passionate interest in camera design. 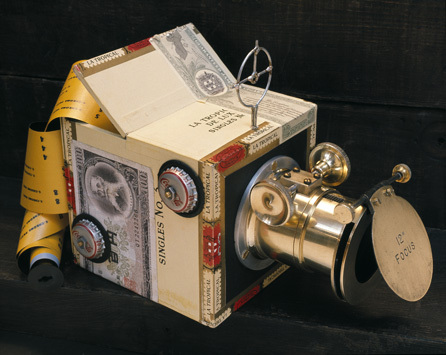 One of my own ‘compact camera designs’ is shown below – this ‘concept model’ was made in the 70′s in my London studio. Below that is a shot of the K10D – progress is a marvellous thing! This ‘camera’ was made for light relief at a time when I was working on a campaign for Kodak pocket cameras which involved making a series of models that they used to illustrate the simplicity and ease of use of their best selling cameras. The charming old brass lens is, I think, from a vintage projector. 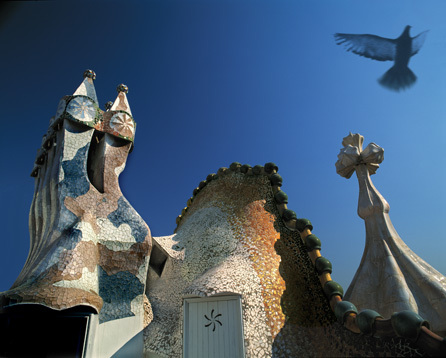 June 25, 2007, marks the 155th anniversary of Antoni Gaudi‘s birth. This year also marks the 100th anniversary of the completion of two of his most important projects Casa Mila (La Padrera) and Casa Batlló. “Man does not create… he discovers”. “Originality consists in returning to the origin”. 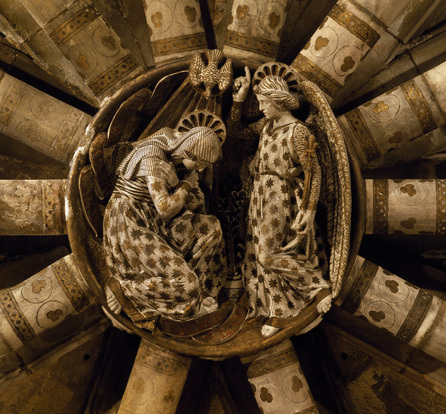 In his old age, Gaudí lived a modest life, satisfied with little and dressed without much care; so much so that the day of his accident nobody recognized him as he lay on the ground. On June 7, 1926, he was run over by a tram at the intersection of Carrer de Bailén and the Gran Vía, and the taxi drivers refused to take a poor vagabond to the hospital (the municipal police fined them later for not assisting an injured man). He did not seek out contact with journalists and he avoided cameras, so there were few photographs of the architect. 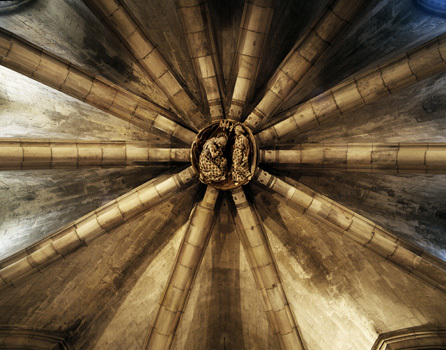 My photographs are of the vault of the Sagrada Familia Crypt where his body was laid to rest. The crypt being the one portion of the temple not designed by Gaudi. It is the work of Francesc de Villar, the architect who was originally commissioned for the project, before Gaudi took over. In contrast to the rest of the temple the crypt is built in neo-gothic style which was not compatible with Gaudi’s progressive ideas. He referred to flying buttresses as “crutches for buildings”. 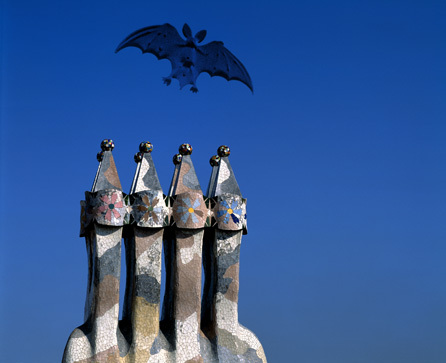 The Casa Batlló roof is pure playful Gaudi fantasy which I compounded by introducing the flying bat – a design element borrowed from the street lamps on the Passeig de Gracia situated immediately beneath this roof. The invention of the broken ceramic tile idiom, “trencadís”, is attributed to Gaudi. It was a way of wrapping tiles around those complex structural curves. The images below are from my unpublished book on Barcelona, shot on several trips to the city in the late 80s and early 90s. The individual elements of the spread are repeated below for clarity. You are currently browsing the Sam Haskins Blog blog archives for June, 2007.